FULL DESCRIPTION A spacious four double bedroom detached family house situated in a quiet residential location in Kings Worthy, Winchester. The property is ideally located just a few minutes drive from the city centre, A34 and M3 commuter links and enjoying the local village amenities including convenience stores, post office and public houses. The property also falls within the catchment area of the highly regarded Kings Worthy Primary and Henry Beaufort Secondary schools. 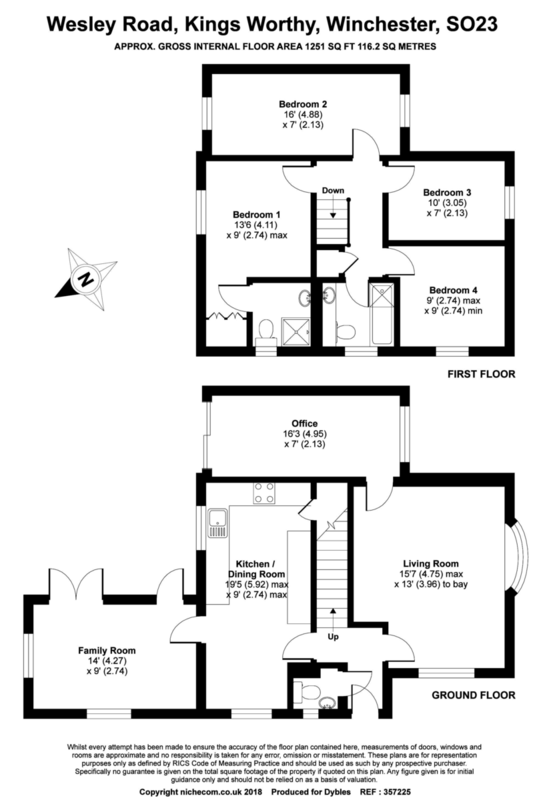 The extremely well proportioned accommodation comprises on the ground floor: Entrance hall, living room, family room, office, kitchen/dining room and cloakroom. First floor: Master bedroom with built in wardrobes and en-suite shower room, three further double bedrooms and a family bathroom with shower over the bath. The property also benefits from double glazing and gas fired central heating. Externally the private rear garden is mainly laid to lawn with a patio area and the property also includes driveway parking.